When my oldest son was about to turn 4 he loved race cars and wanted to be a race car driver when he grew up. So I decided to throw him a really detailed Birthday party. I went to Pinterest and found a *lot* of inspiration and started working on it a few months in advance. When people walked up to the house they were greeted with a themed flower arrangement. I placed red and white flowers along with a flag garland that I made. The checkered flags were printed and cut using my Silhouette and then stitched together using a sewing machine. Once the door was opened there were checkered flags, balloons, banners and pictures hanging. The pictures were from a trip we took to a local museum that had real race cars – Estrella Warbirds Museum & Woodland Auto Display. The Welcome Race Fans! banner was an altered version of one of the posters in the Race Car printable party kit from SIMONEmadeit that I used for a lot of the signage at the party. Every kid got a Pit Crew Pass with their name on it. I printed out the passes and then used laminator pouches that were sent through the laminator. After punching a hole in the badge they were attached to the lanyards. The pass allowed them entry into the Samuel International Speedway. I designed the signage in Adobe Photoshop Elements based on an old speedway sign. Inside the speedway there was a stoplight repurposed from an adjustable 5 shade lamp. The lamp came with the shade colors and I replaced the white lights with colored lights. To make it look more like a stoplight I put a piece of black paper behind the 3 colored lights. 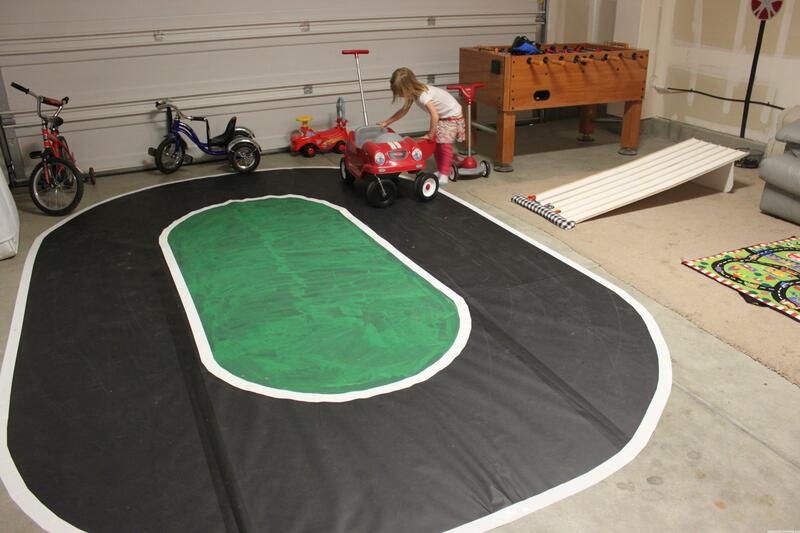 The kids absolutely loved the small racetrack that we put down. The outer track is a big roll of black construction paper. The black lines are extra wide black masking tape and the white lines are White Duck Tape. The green middle is just the construction paper painted with green paint. My dad was very meticulous and managed to make the edges round with lots of little pieces of tape. This took hours to put down but lasted over a year with kids playing on it and an actual car parking on top of it every day! For decorations on the walls I wanted to put up some hubcaps, so I cut them out of metallic silver paper with a metallic red backing. The tire designs were all on the Silhouette store (1, 2, 3) and pieced together with thumb tacks in the center to look like bolts. 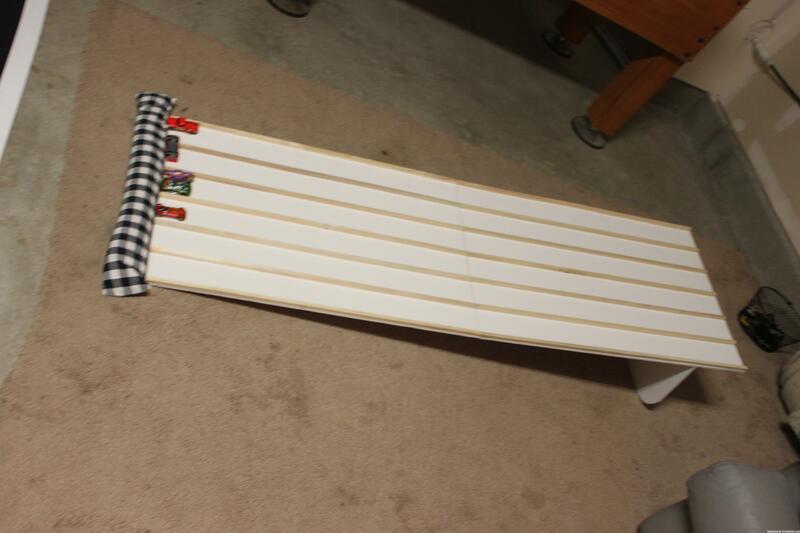 My dad made a racing ramp from foam board and wood dowels for Hot Wheels to go down. To keep the cars from flying across the room I sewed a long checkered bean bag stopper. The kids loved having races together. My mom made this cute race car centerpiece from star balloons bought at the Dollar Tree decorated with race car cutouts and Checkered Flag Duct Tape. For activities there were Make-a-Race Car Sticker Sheets and race car coloring pages. The stoplight toss in the backyard was made from a cardboard box covered with black construction paper with holes cut out for each of the lights. The lights were cut out of construction paper and taped to the box. In the baskets were bean bags sewn from red, yellow, green and checkered fabric. For drinks there were bottles of Pepsi (Gas) and Apple Juice (Antifreeze) that had Checkered Flag Duct Tape taped over the label. The bottles were stored in a red divided bucket from Home Depot. The cheese appetizers had little checkered flag sticks made from Full Sheet Label paper printed with a checkered pattern and cut into little strips. Since there was adhesive on the label they just had to be wrapped around the toothpick and then stuck into the cheese. We served a dinner of Macaroni and Cheese (Hub Caps) made from wheel pasta and cooked in the crockpot. Our son also asked for Hot Dogs (Gear Sticks) so we had those in a crockpot as well. 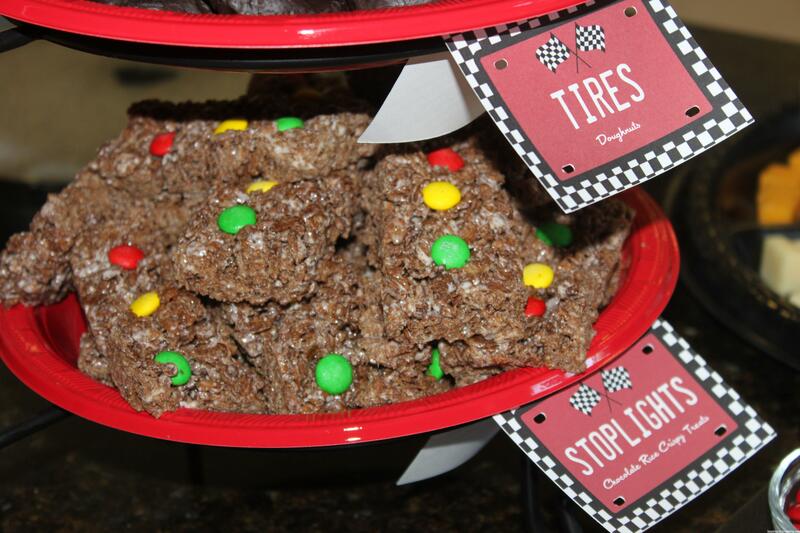 For deserts we had Chocolate Rice Krispy Treats with red, yellow, and green M&Ms shaped to be Stoplights. 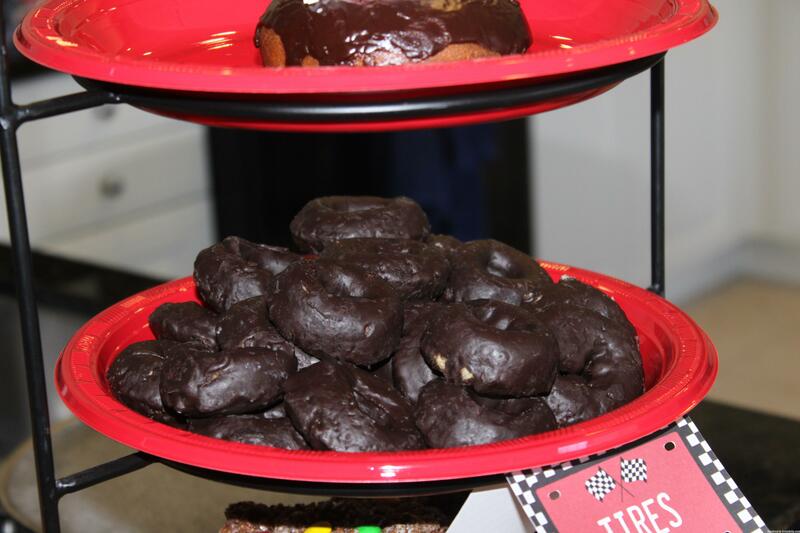 We also had a plate of mini chocolate covered doughnuts (Tires). For our son’s “cake” we had a full size chocolate doughnut that I put a bunch of white frosting in the middle of to resemble a tire. The banner was designed in Silhouette Studio and the checkered posts are the same labels wrapped around wooden skewers. The final part was the candle and he loved it. My printer really worked overtime on this party. It was really great to have a large format printer for all of the large photos and banners. The favors were Apple Newtons in snack baggies with labels. Note: This event happened on July 27th, 2013.